Cordova build iOS error: archive not found at path 'path/to/myApp.xcarchive"
(node:4984) [DEP0018] DeprecationWarning: Unhandled promise rejections are deprecated. In the future, promise rejections that are not handled will terminate the Node.js process with a non-zero exit code. I have tried removing and adding platforms. Also, uninstalling stuff as well. I'm on macOS High Sierra and Xcode 10. There is a work around here. ionic cordova run ios -- --buildFlag="-UseModernBuildSystem=0"
ionic cordova build ios -- --buildFlag="-UseModernBuildSystem=0"
If you are opening the project in the Xcode IDE, you need to change the build system in Workspace Settings to "Legacy Build System"
Neither solution - --buildFlag="-UseModernBuildSystem=0" or setting the Legacy Build System worked for me. For some reason, the error only goes away if I am sure to unplug my iPad or iPhone from usb on my computer before running the cordova build command. Maybe something quirky about my configuration, but I thought I'd share in case it helps anyone else. Cordova iOS supports the new build system since 5.0.0 (see release notes). So update your package.json to "cordova-ios": "5.0.0" (or later) and call npm install. Note, that I had to clean out everything (delete the directories platforms, plugins, www) afterwards in order for it to work. Not the answer you're looking for? Browse other questions tagged ios cordova phonegap cordova-3 or ask your own question. 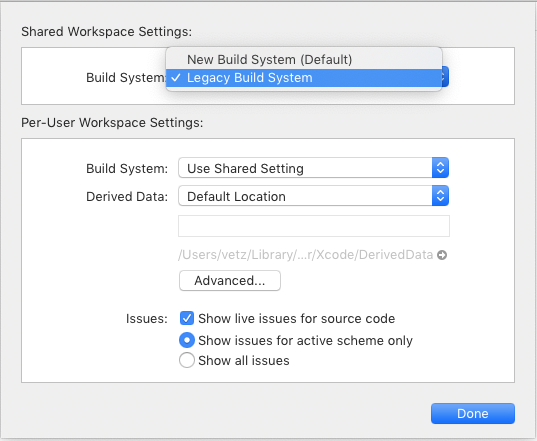 how to fix libCordova.a(CDVLogger.o) ld: 2 duplicate symbols for architecture x86_64 on mac os ionic 3 app? Error when add platform and build with ionic cordova?